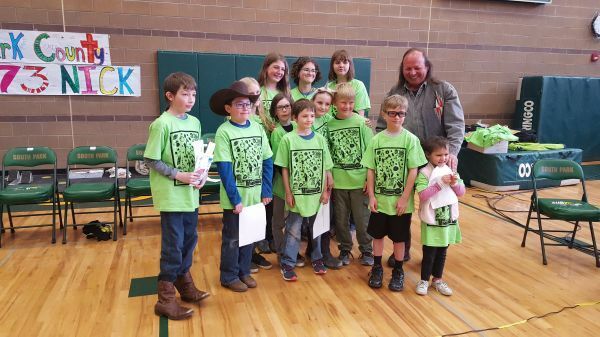 Fairplay Colorado – April 4, 2019 – The Park County Radio Club (PCRC) and the Park County Public Library (PCPL) today announced that the week of April 15th is set for Park County students to communicate with the astronauts aboard the International Space Station using HAM radio. The specific date and time will be determined by NASA the week of April 7th. The actual time for communicating with the astronauts is subject to change and will be posted on the PCRC and Library website as soon as it is confirmed. There will only be about a 10-minute window as the ISS passes over Park County. The ARISS event will take place at South Park High School in Fairplay, Colorado, 640 Hathaway St.
Over the course of classes leading up to the event, several students and parents have been studying to obtain their HAM radio license. They will be testing over the next few months. Pat Shepard had also been studying and is now KEØTQT, a licensed amateur radio operator. A few of the schools have inquired about continuing the program with after school HAM radio programs. The Park County Radio Club and the Park County Public Library announced that April 15th at 11:15 a.m. is set for 13 Park County students to communicate with the astronauts aboard the International Space Station using HAM radio. Thanks Mike! Hopefully we’ll meet at the event. Pat and Dan have worked so hard to get this done. And let’s not forget about those awesome Park County youth! Such an amazing opportunity! Thank you to everyone who is making this possible. Can’t wait! CONTACT - The ISS contact was very succesful this morning with the exception of the You Tube live feed which did not work. We had about 9 minutes and the kids did a great job asking their questions. Thanks to al the voluteers and sponsors who made this happen. There will be a news story on Channel 4 Denver at 5 PM tonight. If you don't get channel 4, it will be on their website later this evening. There will aslo be a few videos and pictures posted on the PCRC website later, after the are edited. This is very inspiring to see these young kids communicating with the space station and studying space. In a way it's a flashback to what we did as kids watching the astronauts in space on black and white television.